Choosing a web hosting is more than just that. According to Syed Balkhi on Huffington Post, a bad web hosting service provider can make you tons of money, fans and even slamming negative SEO on your website. I’m sure you wouldn’t want those to happen to you, right? Long story short, the best web hosting services are more than just ensuring your website is constantly live and accessible. It is the backbone of your business and they need to work hand in hand with you to ensure that you are not only sustaining the website, but you are also making your visitors happy — which one of the factors is having a faster loading website. In this article, you will find not one, but 25 of the best web services known nowadays. They are judged based on pricing, features, and support to name a few. 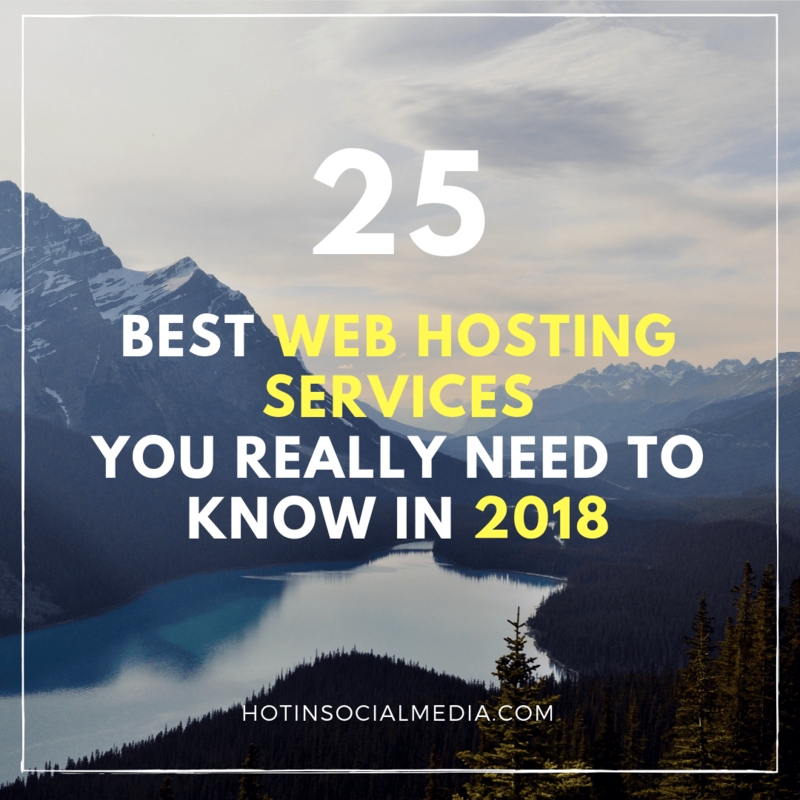 Here is the full list with all the 25 web hosting services you really need to know in 2018. Below every hosting provider in this list, you can read the most important details for each web hosting service like: pricing, features and support features. Through my personal experience, this is by far the best-managed WordPress hosting provider I ever saw. I have both clients and personal websites hosted at WP Engine and they never fail to “wow” me. For starters, I’m a huge fan of customer service and trust me, the staffs at WP Engine really know their thing about WordPress and hostings. Running on Virtual Private Servers (VPS), the performance is excellent. Inbuilt with their own cache plugin, you can leave your website caching to the industry experts. WP Engine focuses on security, scalability, support, community, and speed. Therefore, if you are really serious about managing a WordPress website, WP Engine is probably your best bet. The lowest plan costs $29 per month (signup for a full year and get extra months free) and it could scale up to over $99 per month for bigger sites (and more features). WP Engine is not the cheapest but for the ‘value for money’ section, you are definitely getting what you are paying! WP Engine has several support features which include live chats, knowledge base, email, and phone support. What does this mean? Someone is there and ready to solve your problem. Kinsta offers premium managed WordPress hosting solutions for a wide variety of users: blogs, SMBs (Server Message Block), big websites that have high traffic etc. Pricing starts from $30 per month and for that, you’ll have fast website speed, uptime checks every 5 minute, 24/7 support, and a custom-built site management dashboard. At Kinsta you’ll have a fast feedback support because they have WordPress experts available 24×7 ready to assist you. Disclaimer: I’m one of BlueHost partners but my thoughts here are genuine! For starters, it is used by many influencers such as Pat Flynn from The Smart Passive Income. Let’s be honest here. You may hear tons of negative comments on BlueHost simply because they are apart of the EIG group (read more about EIG here). However, make no mistake. BlueHost is pretty impressive even when they are in the EIG circle and here’s why. There are 4 different plans you can choose from; shared hosting, managed WordPress hosting, VPS and dedicated to each fulfilling the needs of the customers (us). Performance for shared hosting is pretty okay (loading time of about 1 to 2 seconds for a moderately optimized website). Of course, performance is a peak when you are having bigger hosting plans. Shared hosting plans start at $5.99 per month without discount and with discounts, the price will slash to as low as $3.95 or even lower if you are lucky. BlueHost makes it really easy for customers to upgrade and scale up the performance as the website tend to grow in traffic. BlueHost offers live chat, phone support and ticketing system which is awesome. To be honest, most web hosting companies don’t offer live chat when you are paying only a small amount monthly. On the homepage, this web hosting company says that it powers over 1,000,000 customers. For many, iPage is often considered premium even for shared hosting environment and here are the reasons. Personally, iPage is all about selling ‘unlimited’. This means that everything from disk space, domains allowed and bandwidth (for example) are unlimited. Compared to the rest, websites powered on iPage are usually loading around 1 to 2 seconds. However, it is also known by some that several sites experience slightly slower loading speed (over 2 seconds). The pricing structure starts at $9.99 per month without discount. While serving unlimited domains is a great feature, the pricing structure may turn off potential buyers especially when comparing with others. iPage offers live chats, email support and knowledge base for customer support. You can also reach them by calling their helpline which is based in the US. 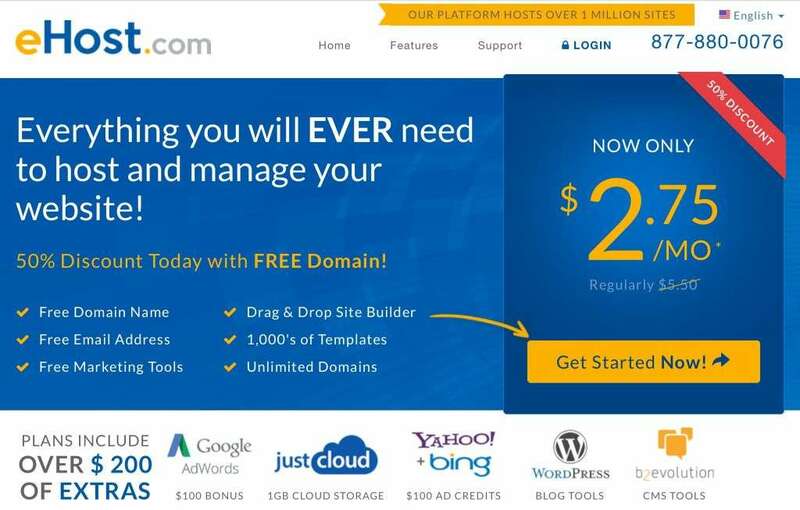 HostGator is my first web hosting service I signed up for. While my main sites are not hosted on them, I still have several secondary ones there. I would like to stress that HostGator is probably the only web hosting service you need to consider if ‘value for money’ is your thing. They have minimum downtime which is great; the more downtime means the more losses you will experience. WP Beginner, for example, is hosted on HostGator and this proves that it is definitely a service worth considering. Plans start with a single domain and all the way up to dedicated servers. HostGator has various plans depending on your budget and requirements. And seriously, I don’t think there is anything that needs to be addressed! Again, HostGator comes with live chat, email, and phone support. The only downside about HostGator support is that when you submit a ticket or engage in a live chat support off the standard working hours, you may experience a longer waiting time. Another popular web hosting services, it is very popular in the US. Straightforward and serves the purpose of web hosting. I have not encountered any experience with them yet. What I love about them is that they have one plan only which makes decision making so much easier. With one plan only in mind, pricing is really easy. They also offer a discount for random users when you visit their site (which I think is a great marketing tactic). Just like other web hosting services, they have live chat and phone support if you need any help. Web.com is a unique web hosting company that takes hosting to the next level. They are focusing a lot on website builders, do-it-yourself websites, eCommerce and mobile websites. If you are looking for a unique web hosting for business, this is probably it! The smallest plan starts at $5.95 per month and it scales up according to depending on your requirements. Pretty similar with the rest, it offers live chat, phone call, and email support as well. JustHost is probably one of the cheapest hosting services I ever saw. Great for beginners and those who just started a brand new website (without experience). Services include free domains, fast setup, email accounts and literally, unlimited everything. It has two main services which include shared and VPS hosting. JustHost is rather cheap where plans start below $6 per month. Currently, it has a special offer which offers huge price slash to only $2.95 only. Support on JustHost is slightly above average for the price you are paying. It offers live chat, phone and email support for customers. DreamHost is a powerful hosting with super affordable prices. Plans start at shared hosting and all the way up to dedicated servers. The biggest attraction for me using DreamHost is the 97 days money back guarantee which is awesome. This is slightly higher compared to other web hosting services at $8.95 per month. The higher price actually offers better and more prompt response. Apart from the traditional support, they also have an active forum which is great to find for solutions. InMotion hosting is popular among businesses due to the professional look and addon services they offer. Unlimited everything; from bandwidth to disk space. Majority of their hosting plans comes with SSD which helps to increase loading speed. Without a discount, plans start at $7.99 per month for shared hosting. Currently, it has a discount where you can get as low as $3.49 per month. Live chat, phone support, and email. Majority of the support are replied within an hour (or less) from the time posted. GoDaddy is more than just a domain registrar. It offers excellent hosting packages as well. It offers a full range of hosting services to fit all walks of life; from shared hosting to dedicated servers, GoDaddy has them all for you. GoDaddy offers several promotions and discounts such as free domains, free email addresses, and sa traightforward control panel. The smallest plan starts at $3.99 (with 42% discount) while managed WordPress hosting costs as low as $1 per month. Until date, GoDaddy is one of the cheapest managed WordPress hosting out there. I have a personal account with GoDaddy using managed WordPress hosting and it is really fast. It comes inbuilt with cache plugin and therefore, you do not need any additional cache plugin. GoDaddy offers support via email and telephone. Unlike several other web hosting company, they are working round the clock which is useful in the case of emergency. Apart of Web.com family, it is often considered an entrepreneur or corporate web hosting provider. It offers two different best web hosting services; do-it-yourself or custom. In DIY websites, all you need to do is to signup for a domain name, design your website with pre-built themes and you are all set! Yes, this means that setting up a website in just 3 steps. In custom web hosting services, a professional team of developers will build your website from the ground up. Therefore, you get a customized site according to your needs. DIY website hosting costs as low as $2.95 per month while custom hosting services would require you to contact them personally for a quote. Support here is pretty standard. You are able to reach the support team via email and phone. If you are active in Web Hosting Hub Talk forum, you’ll know that this is a popular web hosting service for beginners. For me, Web Hosting Hub is just like other shared hosting providers They provide everything from email to multiple domains hosting. The only downside I see about Web Hosting Hub is the backup which costs $1 per month. The smallest plan, Spark costs $4.99 per month and it is really easy to scale it up according to your website traffic. I had only one experience with them. The support is fine and they get the job done (as requested). You can reach them via phone, email and live chat services. SiteGround is one of the best ‘value-for-money’ hosting providers until date. SiteGround focuses on three main platforms, WordPress, Joomla and Magento (they still accommodate the rest though). If you are using either one of these platforms, hosting on SiteGround will allow you to enjoy several benefits such as speed boosters to reduce your website loading time. GoGeek plan is awesome especially with the staging feature and trusts me, you are going to love it if you are a web developer. Plans start at $3.95 per month and with all the goodies that come with it, this is definitely worthwhile! Support is easy especially with the live chat, email and phone support. in most cases, email supports are responded under 30 minutes. Ipower is probably the most comprehensive web hosting services out there with very affordable pricing. Ipower comes with 8 different web hosting services to choose from. Whether it is for a brand new website or established ones with high traffic, Ipower has everything you need. This best web hosting services are also powered by the wind which is an excellent step to go green. Plans start at $3.95 per month and it scales up accordingly. In terms of support, there is a live chat, phone support, and email if you need any help. With Ipower, help is just one click or call away. Looking for a domain name along with a web hosting service? Register.com has the right plan for you. If you are new to blogging and starting a website, this company offers a pre-made template for you to choose from. This means that you can launch your website in no time! The best part? It costs you only $12.95 per month. Highly affordable especially when you have a domain, hosting and template all bundled up in one. If you need help, you can easily reach out to them via email or phone call. From the business owner to the individual who desires full functionality on a small budget, HostMonster provides your complete web hosting solution. Make no mistake. HostMonster offers a lot of features compared to other shared hosting services. What attracted me the most is that they have hotlink protection, htaccess support, and customized error pages. Pretty straightforward web hosting starts at $3.95 per month for unlimited websites, bandwidth, and space. HostMonster provides various supports (some are 24/7) via phone and emails. If you are looking to steer away from those sardines packed web hosting space, Dotster is the best choice! Dotster provides services such as Linux, Window and VPS hosting. For me, it is a pretty much your ‘average Joe’ in hosting. Prices are also very affordable which starts at $3.75 per month. You can reach out to Dotster support via email, live chat, and phone call. I personally call this an affordable web hosting for bloggers. The low plans and above average support is excellent especially when the budget is in mind. I would give 3.5 out of 5 if I have to. What I love about Arvixe is the freebies and add-ons I even with the smallest plan. I would call this a performance but they even offer website transfer which is awesome, to say the least! The lowest package starts at $4 per month and it can go over $100 a month for cloud hosting. The pricing structure of Arvixe is very flexible where you pay on packages you can afford (which is excellent especially when the budget is an issue for you). Live chat, ticketing feature and knowledge hub; that’s what you get when you sign up for Arvixe. Here’s the thing: Paying around $4 per month and having live chat support? Priceless. 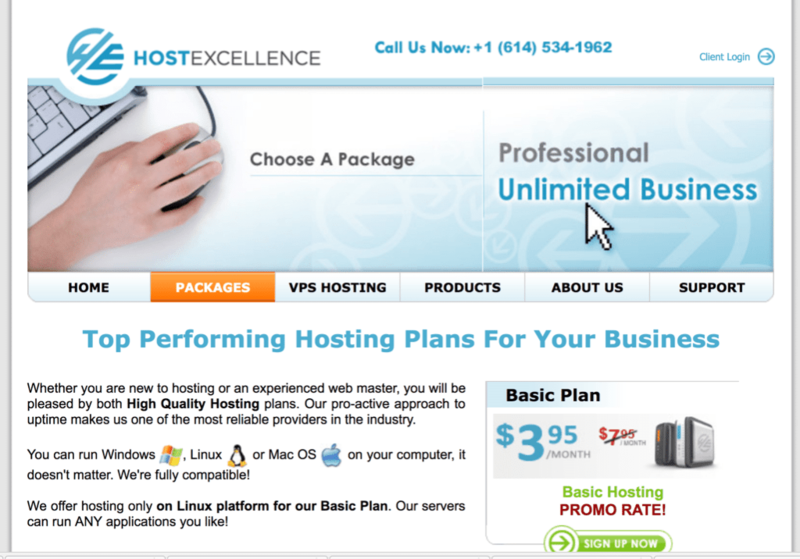 Host Excellence is another smaller hosting company with above average hosting features and support. They take pride by providing hosting services without hidden cost. There is also no setup cost involved and they provide free domains as well. Pricing starts as low as $3.95 per month. Support is possible using phone and email (pretty decent and similar to others). Not your average hosting services to say the least. Several features that attracted me are integrated Google webmaster tool and search, SiteDelux and inbuilt newsletter features. Pure Host is more expensive with the basic plan starts at $19.95 per month. Depending on needs, I would say this web hosting is slightly over-priced. Again, the usual support includes live chat, email, and phone call. Pretty decent and as what expected for the price you are paying monthly. Ehost is a simple hosting services for beginners. At $5.95 per month, you’ll get unlimited bandwidth and space for all your hosting needs. Do note that eHost provides RAID storage which is often considered more powerful compared to conventional storage. eHost provides support via live chat, email and phone on a 24/7 basis. A Small Orange is a refreshingly different web hosting company which prides itself on providing fast, reliable hosting with exceptional customer service. This web service provider focuses on solving the needs of the customers. They have plans such as Tiny, Small and Large. For example, Tiny is excellent for startup or bloggers while Small and Large are more fit for websites with more traffic and require more performance. Super affordable especially when the smallest plan starts at $30 per year. Do I need to say more? Customers can easily reach out to the support team via phone, live chat, and email support. Managing your own VPS like a professional. Want to have a VPS but don’t have the knowledge to manage it? Don’t worry, Cloudways does that for you! Signup for a plan with Cloudways (all are VPS) and they can either be served on Digital Ocean, Amazon Web Services or Google Cloud Platform from $5 a month. Support is excellence; 24/7 support using live chat and email. You can’t go wrong with any. A great alternative to WP Engine when it comes to managed WordPress hosting. Among all the web hosting providers, Pagely has the best security features. On top of that, there is PressCDN included in all plans. This means that your website is powered by a premium CDN without extra cost. Did you know that Pagely is built on Amazon Web Services? Hosting a single site on Pagely cost $24 per month (and you’ll get some discount if you pay up yearly). You can easily create a ticket via Pagely’s custom control panel. Most tickets are responded under 60 minutes. So, which is your favorite web hosting services provider from this list? What web hosting service are you using right now? Please write a comment if you are looking for a better web hosting service or not. Adi Domocos is the Founder of Hot in Social Media. After working for several years in different international companies from Marketing Manager to Country Manager, he decided to launch a site in a field he really loves: Social Media Marketing. He’s a social guy who tries to help and cheer up those around him.